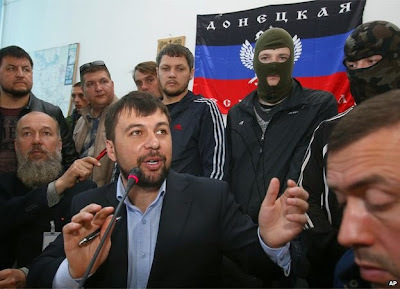 DONETSK, Ukraine -- Pro-Russian separatists in Donetsk say they will not leave the government building there, defying the Kiev authorities and threatening a new international deal on Ukraine. The "Donetsk People's Republic" refuses to recognise the Kiev authorities. The separatists' spokesman said that the Kiev government was "illegal" and so they would not go until it stepped down. Russia, Ukraine, the EU and US earlier agreed that illegal military groups in Ukraine must leave official buildings. The deal was reached in Geneva. The sides agreed that illegal military groups in Ukraine must be dissolved, and that those occupying buildings must be disarmed and leave them. The foreign ministers also agreed that there would be an amnesty for all anti-government protesters. US President Barack Obama has cautiously welcomed the Geneva deal. But he warned that the US and its allies were ready to impose new sanctions on Russia - accused by the West of supporting the Ukrainian separatists - if the situation failed to improve. A tense standoff continues in eastern Ukraine, where separatists - many of them armed - are occupying official buildings in at least nine cities and towns. Alexander Gnezdilov, spokesman for the self-proclaimed Donetsk People's Republic, said his group would evacuate the government building in the eastern city only when the "illegal" Kiev government vacated parliament and the presidential administration. Another protest leader in Donetsk said the separatists would not leave unless pro-European Union demonstrators in Kiev's Maidan Square - the vanguard of the protest movement that toppled President Viktor Yanukovych, an ally of Moscow - packed up their camp first. A statement from the Donetsk separatists said "we cannot accept the values of the Kiev junta, we have our heroic past going back to World War Two, we are the Russian bear which is waking up". "Don't worry, everything will stay peaceful and orderly. The only problem is if the Kiev junta want war." They said they would not ask Russia for help yet, but "we will have a referendum before 11 May, about Donbass independence - after that we will ask for help". Addressing the Ukrainian parliament on Friday, interim Prime Minister Arseniy Yatsenyuk said an amnesty bill had been prepared for separatists who laid down their arms and left government buildings - and he urged them to do so. "Russia was made to condemn extremism and to agree that all bandit groups should immediately lay down arms and vacate premises. So vacate. Your time is over. We are urging them to immediately observe what the Russian minister signed and to leave Ukraine alone," he said. But later the Ukrainian interim authorities struck a more conciliatory tone. In a joint televised address, Mr Yatsenyuk and acting President Oleksander Turchynov appealed for national unity and promised to meet some of the demands of protesters in the east of the country. They said they would support constitutional change, including the devolving of power to local councils - including over their official language, a key demand of Russian-speakers. The interior ministry in Kiev issued an arrest warrant for Olexander Yanukovych, the eldest son of fugitive ex-President Yanukovych and a millionaire businessman, for alleged forgery of documents; the ex-president fled to Russia in February - it is not clear where he or Olexander are now. Russian shares bounced back after the Geneva deal - the RTS index in Moscow was up 2.8% and the MICEX up 2.3%. They had slumped earlier in the week. Russia demanded that Kiev explain an official notice restricting entry to Ukraine for most Russian men aged between 16 and 60. Media spotlight on Putin Russian newspapers devoted their front pages on Friday to coverage of a four-hour televised phone-in with President Vladimir Putin, rather than the Geneva talks. "Vladimir Putin: You don't need to worry about a thing" said the front-page headline in Rossiskaya Gazeta, while Kommersant bore the headline: "Putin charts a stubborn line". Mr Putin was repeatedly applauded by Russians during the live event, in which he demanded firm security guarantees and equal rights for Russian-speakers in Ukraine. He said he hoped he would not have to use his "right" to send Russian forces into Ukraine. Moscow has tens of thousands of troops massed along the border with its neighbor. Mr Putin was speaking after Wednesday night's clash in Mariupol, eastern Ukraine, in which three separatists were reportedly killed by Ukrainian security forces after hundreds of pro-Russians attacked a military base. But speaking in Washington just hours later, President Obama expressed scepticism as to whether Russia would keep its side of the bargain. In a telephone call with UK Prime Minister David Cameron, the two leaders agreed that the United States and Europe were prepared to take further measures to impose a new round of sanctions if Russia failed to help restore order. "We do want to see over this weekend Russia take the necessary actions to reduce tensions to make sure the agreement in Geneva yesterday is upheld. "We believe that Russia contributed to destabilising the east of Ukraine over the last week, now it's an important obligation on them to contribute to stabilising it. "We will all want to see evidence of that otherwise we will return to imposing more sanctions on Russia as we agreed at the beginning of the week." Ukraine has been in crisis since President Yanukovych was toppled in February.